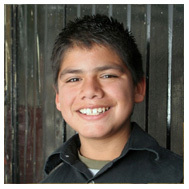 Rolando and his two brothers came to Emmanuel Children's Home when they were 5, 6 and 7 years old. Their father was left alone to care for his three sons after their mother left them. The boys' father was forced to leave in order to earn more money and left Rolando and his brothers with relatives. Rolando's father began to notice that he became very uncomfortable, even fearful, each time the father would leave to go to work. He finally learned that his brother, Rolando's uncle, was molesting Rolando. Their father was mortified and took the boys away. He knew he needed to find a safer place for his children. Emmanuel Children's Home was able to provide the three boys with a warm, nurturing environment. Rolando is now 13 years old, and attends junior high school. He loves living at Emmanuel and is now known there for his athletic abilities and helpful attitude with his teachers. to be easy, but I soon realized not everything was like I thought it was. When I got to the bridge on our outside adventure day I was scared and I didn’t want to do it. But with the encouragement of my friends and counselors I was able to conquer the bridge.